With the increase of people experiencing Sciatica, patients have resorted to various forms of treatments. Acupuncture for Sciatica is a solution that people are exploring. Acupuncture can be used in conjunction with other treatments, Massage or Chiropractic, for controlling and alleviating sciatic pain. Symptoms of Sciatica may be: burning or knife-like pain in the lower back or buttocks, pain that radiates from the lower back into the groin area, down the sides or back of the leg. It can be hard to find relief from sciatica, and many people simply try bed rest in hopes that it will go away. Western medical doctors will often prescribe anti-inflammatories or suggest over-the-counter pain relievers. Compression of the sciatic nerve that exits from the base of the spine. A pinched nerve due to trauma or inflammation in the piriformis muscle (known as pseudo-sciatica). Compression of the sciatic nerve due to a slipped/herniated disc due to trauma or a natural process. Acupuncture is effective in resolving the causes of Sciatica. When a slipped/herniate or degenerative disc disease is involved, acupuncture can relieve the secondary inflammation and muscle spasm, and the pressure can usually be reduced enough to relieve the pain entirely. Reduces the pain and inflammation of sciatica by stimulating endorphine release. Improves blood flow to the lower back increasing circulation. Relax muscle spasms that may be irritating the sciatic nerve. Sciatica pain is excruciating and may result in immobilization of the patient. 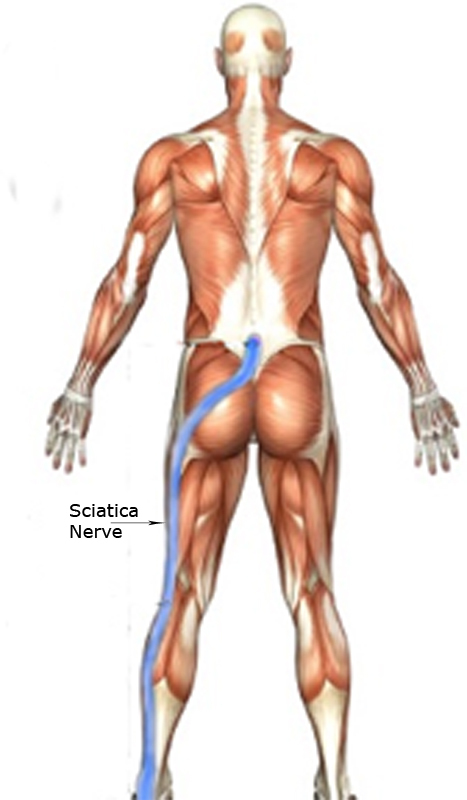 Sciatica nerve disorder rarely causes permanent nerve damage. Most pain syndromes result from inflammation, which can get better within a few months if treated properly. The condition requires effective pain management. Natural method of pain relief, such as acupuncture is better than a prolonged use of pain relieving drugs. This entry was posted in Acupuncture and Pain and tagged acupuncture, auto accident, back pain, hip pain, joint pain, knee pain, leg pain, migraine, neck pain, pain, sciatica, shoulder pain, tension headache. Bookmark the permalink.